Osseointegration was discovered in the 1950s by professor Per -Ingvar Branemark and is based on the ability of human bone cells (orange) to attach to a metal surface (green). 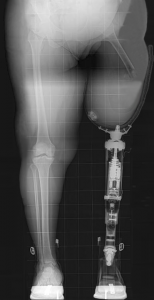 To date, osseointegration is used for permanent anchorage of artificial limbs to the human skeleton. In a surgical procedure a metal (titanium) implant is inserted into the bone of the arm or leg and this implant penetrates through the skin. 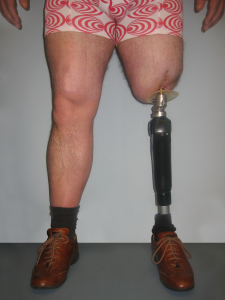 The artificial limb (prosthesis) is easily attached to this implant with a connector. 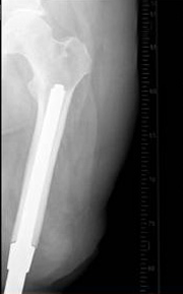 For patients with extremity amputation, osseointegration offers many advantages in comparison to socket prostheses. The attachment of the osseointegrated prosthesis is much more stable and this allows for much improved walking and joint movement. An osseointegrated prosthesis does not cause skin breakdown. Because the prosthesis is directly attached into the bone, patients feel their prosthesis as part of their own body by natural osseoperception. 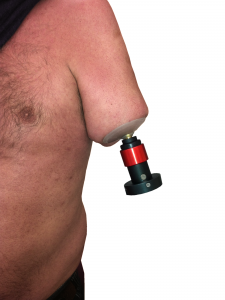 This highly innovative technique contributes to the amputees’ quality of life. 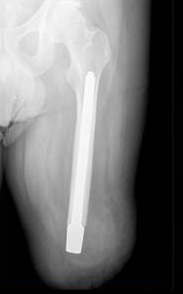 In 2011, the Radboudumc AOFE Clinic in The Netherlands carried out a socket versus osseointegration study in the 22 patients. Gait and quality of life were assessed. In this study it was found that prosthesis use increased from 56 to 101 hours per week, walking speed increased with 32% and walking with an osseointegration prosthesis cost 18% less energy. 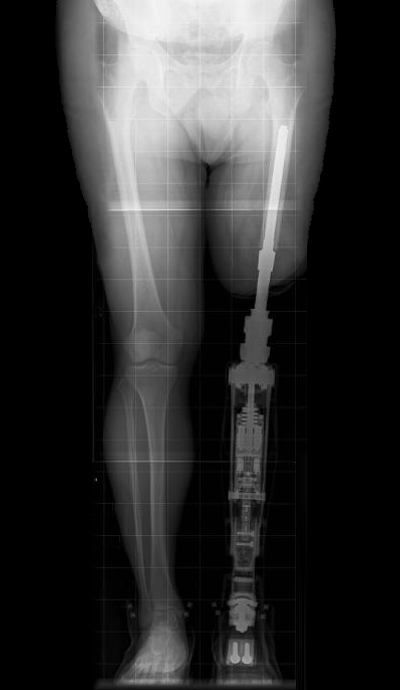 With osseointegration, the prosthesis-related-quality of life improved from 39 to 62 on a 0 to 100 scale. Are there any disadvantages of osseointegration ? Osseointegration is a safe treatment. Inflammation of the bone is rare. A disadvantage is that the area where the implant penetrates the skin (=stoma) needs to be cleaned with water and soap twice daily. This is comparable with brushing teeth. In some cases the skin at the penetration area may become irritated. In the first year after implantation you may have intensive muscle pain. This muscle pain disappears as soon as the stump muscles become fitter and stronger. 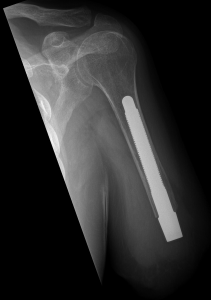 What happens with the bone with an osseointegration prosthesis? Most patients treated with osseointegration have weak bone because of disuse osteoporosis. In the socket prosthesis the bone is not loaded and the stump muscles are not active. This may result in decreased muscle volume and weaker bone. With osseointegration the natural load of the bone is restored and the stump muscles are reactivated to stabilize the bone. In the Radboudumc Osseointegration Clinic in The Netherlands, bone remodeling processes have been evaluated and the data show that the bone around the osseointegration implant becomes thicker and stronger. Does my health insurance company pay for the osseointegration treatment? In Europe most health insurance companies reimburse the osseointegration treatment. Before your first consultation with the osseointegration team you will have to get an agreement of your insurance company about the reimbursement. 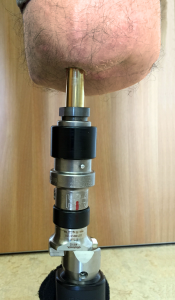 Can I do everything with my osseointegration prosthesis? With an osseointegration prosthesis you can do all daily life activities including taking a bath, swimming in the sea, river, lake, pool, going in the sauna, bicycling, sailing etc. Contact sports including; fighting, soccer and skiing are not recommended. You may do these sports without wearing your prosthesis. 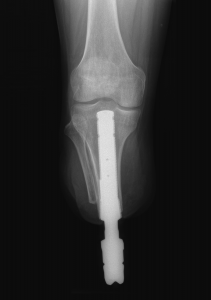 Am I suitable for osseointegration? Intake: After agreement of your Insurance company you send us a request for an intake. The intake procedure is to evaluate whether you are a suitable candidate for osseointegration. The intake is to inform you about the osseointegration procedure this also includes a consultation with a patient with an osseointegration prosthesis. When you are a suitable candidate you will be prepared and scheduled for surgery. 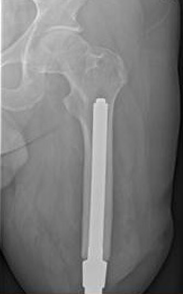 Surgery: The metal implant(Titanium) will be inserted into the bone of your stump. If necessary the length of the bone will we adjusted and the soft tissue corrected. After the implantation the wound is closed. Then a small skin incision is made and a connecting adapter of the osseointegration prosthesis is put through this incision into the implant. This skin penetration point is called a stoma. After the surgery you will be observed in the hospital for three to five days. In the hospital you will get instructions how to clean the stoma. Your prosthesis will be prepared for the connection with the osseointegrated implant by our prosthetists. After discharge from the hospital you will stay during the rehabilitation in a hotel or apartment close to the hospital. Rehabilitation: One week after surgery the osseointegration rehabilitation starts. This takes place every day in our rehab department. You step-by-step learn how to load the prosthesis and how to walk with crutches. Below knee amputees will complete the rehabilitation in three weeks. Above knee amputees complete rehabilitation in five weeks but will have to do exercises at home before they are able to walk fully weight bearing on the osseointegration prosthesis without crutches.